The City of Longmont sought to maximize transit‐oriented development (TOD) opportunities in an area south of downtown Longmont. The key components of the analysis included (1) a site capacity analysis of the 1st and Main transit site to determine potential ranges for the amount of supportable TOD; (2) a financial model documenting revenues and expenditures for the City over a 25-year period including estimates of tax increment attributable to the redevelopment; and (3) a strategy for land assemblage, execution of the vision, and next steps to attract public/private partnerships to implement a TOD at the 1st and Main site. 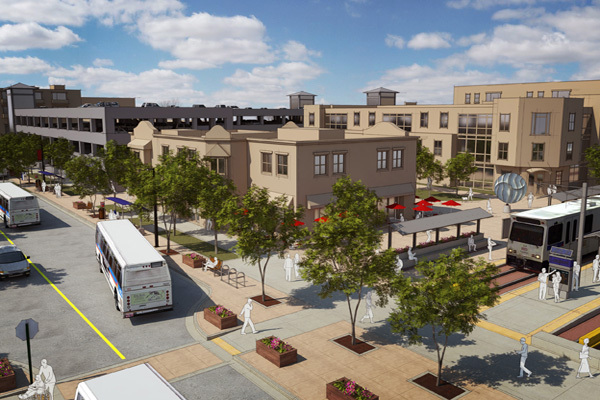 EPS teamed with a planning firm, the City, and the Regional Transportation District (RTD) to develop a number of site plans that accommodated the needs of RTD and also respected the vision the City had established for revitalization. The development options provided alternative concepts for office, retail, multifamily housing, and structured parking. EPS provided recommendations regarding the highest and best use for the site from both a market and placemaking perspective. These recommendations were based on market analysis completed by EPS and financial pro forma that evaluated the feasibility of constructing alternative types of development. EPS provided both the City and RTD with greater clarity regarding the vision for the station area and a more concrete set of steps that can be taken to move that vision to action. Components of the analysis were used as inputs in a residual land value model that provided that City with an estimate of potential revenues that could be generated by future land sales. City Council supported the vision and financial analysis and is moving forward with an infrastructure master plan for the area.